Last week I was invited to the AWS Popup Loft in Tel-Aviv to give a talk about creating Slack bots and integrations. I wanted to see if I could push the limits of the Arduino platform and connect it directly to the Slack Real-Time Bots API, without any intermediate server. Four hours and one pull-request later, I finally created the first Arduino Slack Bot ever. 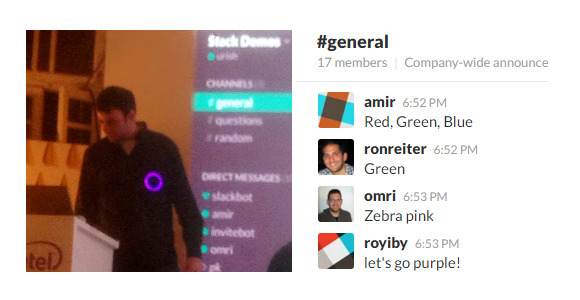 I connected it to a slack channel where the meetup attendees hanged, and they were able to change the color of my shirt during my talk. Arduino does not have any Internet connectivity options built into it, but there are plenty of Arduino shields and Arduino based-boards that have either Ethernet, WiFi or 3G connectivity built-in. 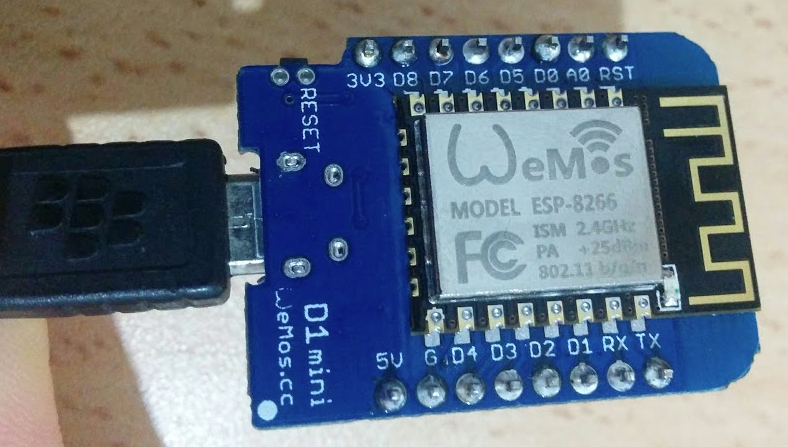 For my project, I used the WeMos D1 Mini — A tiny ESP8266-based board that can run Arduino code, has built-in WiFi support, and is small enough to hide behind my shirt’s pocket. The best thing about the WeMos D1 Mini is the price: you can get it for just $4 USD from the official manufacturer’s shop. The other ingredient you will need is a RGB LED Ring. I used a ring with 24 NeoPixel LEDs. These LEDs need only single digital pin for control, you can chain them together, and they come with an excellent Arduino library that allows you to control the color of each led individually. You can get the official 24-LED Ring from AdaFruit for $16.95 USD, or find cheaper ones on eBay (search for “24bit ring WS2812B”). First of all, make sure you have Arduino 1.6.7 or newer. You can download the latest version here. Then, you will need to set up your Arduino environment for ESP8266 development, as explained in this AdaFruit tutorial. You can check you setup by running the ESP8266 Blink example. Make sure that the correct board is selected in the Board section of the Tools menu. 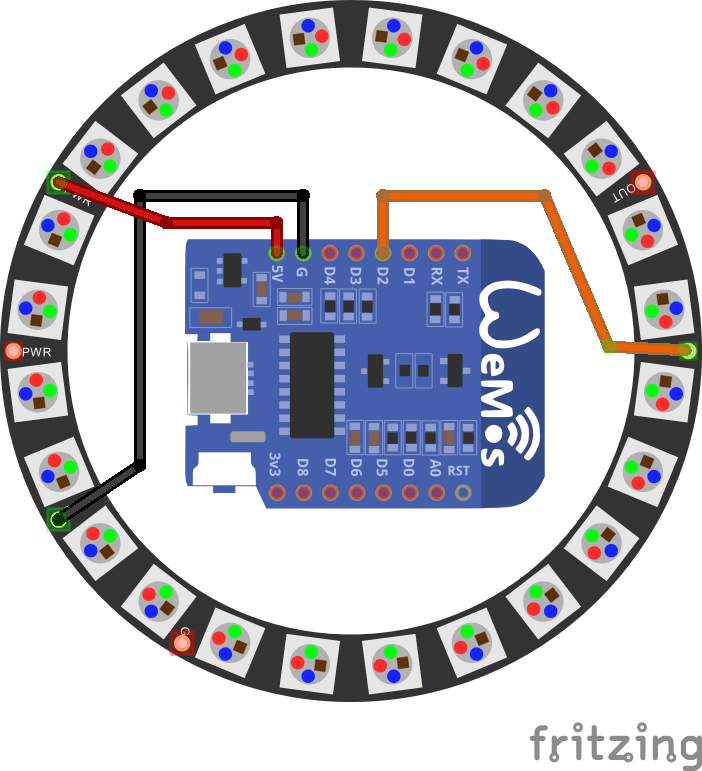 If you use the WeMos board, choose “WeMos D1 & R2 Mini”. Also make sure to select the correct Serial port in the Port section of the Tools menu. Next, open the File menu, and then select Examples > ESP8266 > Blink. Upload the Sketch to the board, and the on-board LED should start blinking. Let’s create our Slack Bot! First of all, we need to set up a few things on the slack side. Copy the API token of the bot, we will need it soon. Customize the bot details and avatar to your liking, and click “Save”. Before running this code, make sure to set the three defines on the top: SLACK_BOT_TOKEN, WIFI_SSID and WIFI_PASSWORD. Note that the JSON returned by the rtm.start API call can be very verbose and may not fit in memory. Thus, I decided to simply stream the reply until I see something that resembles a websocket URL, by looking for the text “wss://”, and then manually parse the host and the path out of the URL. This approach works well with only 4 lines of code. If you PM your bot through slack, your message will also appear in the output. Call this function immediately upon establishing the web socket connection, and then call it again every 5 seconds. This will ensure that your connection with slack stays alive. We managed to put together a simple Arduino program connects to Slack and listens for events through the Real Time Messaging API. 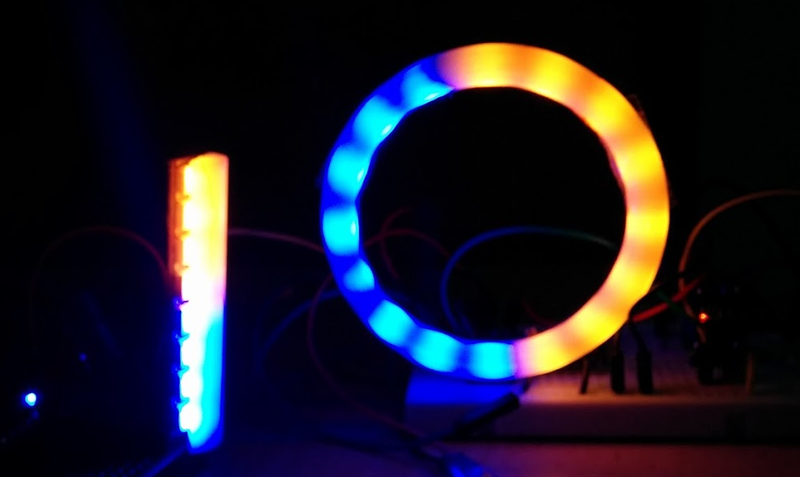 By using the NeoPixel code we created above, we can now make the ring change colors according to commands received through slack. You can also try the special “rainbow” effect. A bot that has a temperature sensor and reports to slack. Then, connect it to the AC switch and control the AC directly from your slack channel!